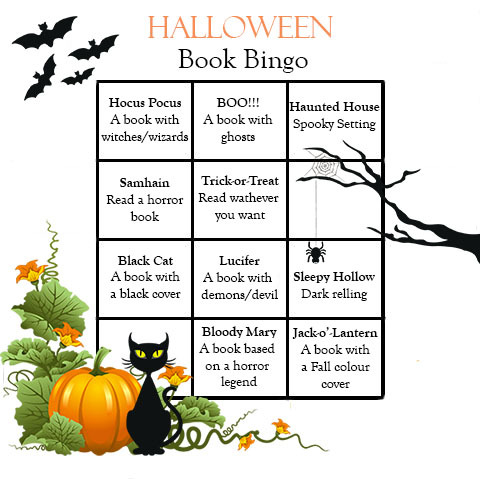 Welcome to Halloween Book Bingo! Everyone loves Halloween. Trick-or-Treat, hocus pocus, jack-o'-lantern... It's the scariest time of the year. This year, I invite all book dragons to celebrate Halloween with a bookish bingo. Halloween Book Bingo will take place between Wednesday 27th September to Tuesday 31th October, 2017. Everyone is encouraged to register their interest in the sign up form below, which will be open from now until October 7th. Everyone registered will be eligible for the giveaway. You should read one book for each square -the same book can't be used twice, sorry. If you don't know what to read for a certain category, every Sunday I'll write some fun Halloween inspired posts and I can make some book recommendations. The winner will receive a book of her/his choice up to 15 euros (I know it is not much, but I'm the paying for it). The winner will be chosen November 7th. One entry for every book you finish between 27th September to 31th October. Maximum of ten entries. On November 1st, I'll open a new form where you can share with me your wrap-up. Hi. Thank you for letting me know. :) I think the link is working now. However, if it isn't, you can leave the link to your sign up post here on the comments. I won't forget to add it to the entries for the giveaway. I signed up in the linky above, but will have to do a sign up post later this week!